my apologies for not writing sooner but it's been a crazy week.... and now there's a nasty thunderstorm rolling through meaning I gotta jump back to the laptop here before a bolt of lightning blows up my PC. OH YEAH, that was a big one, house is rattling with that one, and it lasted awhile too. I'm not saying we don't get nasty storms, just not usually in the winter. To make matters worse, my daughter still isn't 100% convinced that we are safe in the house during a storm, I on the other hand am not worried. Ok, sorry, we should talk ice cream. (BOOOOOOOMMMMMM). So when my ice cream loving wife went to cold stone creamery last weekend, she actually brought home two treats. The first you saw on Monday, but I really need to share what else she brought home. 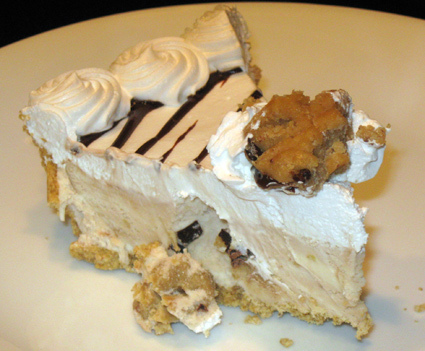 This my friends is a cookie dough ice cream pie!! It has been pure torture not jumping into this thing all week long. Heck, in the old days I probably would have thrown a slab (CRRRRAAACCCKKKKK) of the heart cake on top of the cookie dough pie and called it a night. But I'm not 18 anymore, so I have to maintain a little discipline (RUMMMMMBLLLEEE). Ok, honestly, I was seriously tempted to have this bad boy for breakfast a few times too. I finally gave in last (gruummmbbbllee) night and had a small slice and I'm about to have another slice as soon as this silly storm passes. Let's take a look at my slice. Now doesn't that look simply fantastic? (RUMBLE) Ok, ok, the picture didn't come out perfect since I managed to slice right down into a big ball of cookie dough. With that said, don't be afraid because it tastes as awesome as it looks. It's cake batter ice cream with cookie dough, caramel & fudge in a graham cracker pie crust covered in a creamy white frosting. Let me first point out the most excellent and thick graham cracker crust. No little wafey thing here, these graham crackers gets noticed! It's a fairly dry crust and that's fine with me. Ofcourse, you could put a nice graham cracker crust on anything and I'd eat it. I bet you could technically make the crust a little bit thicker, but it's real close to the perfect ratio as it is. Last we have a very thick whip cream frosting. If I wanted to be really picky, I'd say the frosting cream is just a smidge too heavy. It's excellent, but rather than a heavy frosting I think it could be a little lighter and a little smoother like regular whip cream. (CRRRRAAAACCCCCKKK) I should clarify that it's really rich too. Again, it's right on the border or almost too rich. When these 3 come together, well, it's magic really and I could easily attempt to eat at least half the pie in one sitting.... must resists urge to try. 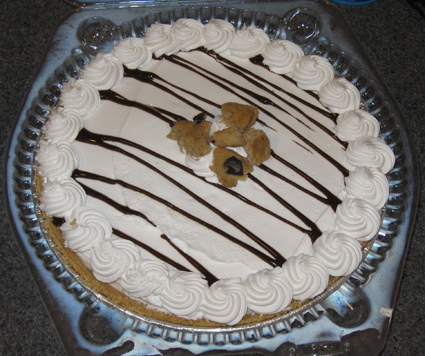 You know, I wonder how the cookie dough delirium cake holds up against the pie with the big difference being the inclusion of vanilla cake. All I know is that we all agree that this stuff is really good. (hey the storm is gone). Oh I cant forget to mention the pieces of cookie in the center of the cake for good measure. Well, it looks like a cookie, but it tastes like cookie dough. MMMMMMMM, excuse me while i scoop the graham from the bottom of the pie plate. Ahhhh. On Second Scoop: Oh my, I just ate the largest chunk of cookie dough in a cake ever and it was fantastic. I have to admit that this really is a wonderful treat. My best advice here is that you should take it nice and slow. It's a heavy, rich treat and you just won't appreciate it if you wolf it down (which I have done on one of the three slices I've eaten). My only insignificant compliant here is that I still think the frosting is just a little too rich, so much so that it becomes a lingering aftertaste. That said, you're still going to love this one. Um, nice review, except for the constant moaning about calories, etc. Does one really want to hear about this on an ice cream review site? geez, i only made one comment at the end because this is a very filling treat. Your storm noises were pretty funny. I could totally imagine a house rumbling as a person's trying to focus and type. I was wondering why you never mention the cold stone rival, baskin robins. They have ok tasting stuff too, no? I would totally go to baskin robbins.... if there was one less than an hour away. Baskin Robbins surged about 7-8 years ago and created these baskin robbins/dunkin donuts everywhere (good shakes! ), but they quickly faded away. Weird, they still show up on google maps!